"A Knowledge-y Sort of Taste..."
If, on a lazy sort of Sunday afternoon, your mind wanders to the depths of history in search of humanity's first forays into the realm of heroics, I will forgive you if Jack Black and Michael Cera are not the first potentials that come to mind. Nevertheless, the comedic duo is filling those hero shoes enthusiastically in Harold Ramis' latest film, YEAR ONE. Even though, for some of us, just the promise of having these two misfit characters doing their thing is enough to get us into the theatre to watch this film, there is another incentive in the form of a fun, evocative, and surprisingly intelligent score from THEODORE SHAPIRO, whose various credits have earned him the title of the "king of comedy scoring". 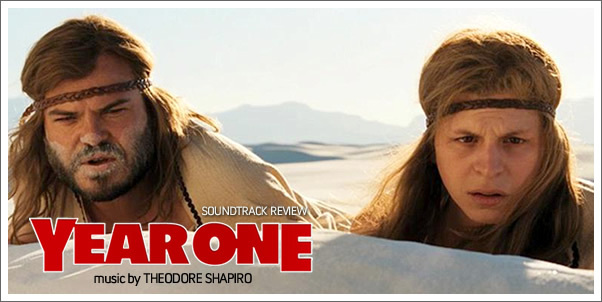 Though the film itself hardly breaks any new comedic ground, it offers up a unique set of opportunities for SHAPIRO to develop his technique of providing large-scale, serious, and impressive musical scores for projects —something we've seen previously in TROPIC THUNDER as well. "Serious" does not seem like a word I should be using to describe a comedy score, and I'm by no means implying that the score isn't entertaining and fun —because it is —but it carries the comedy in a dignified way.